Five days a week my existence on this earth pretty much boils down to concrete, metal, glass and an uncomfortable chair behind an old desk. I answer emails, ignore phone calls and push a lot of paper. If I strain my neck when I press my face up against my office window, I can almost see the sky. On Friday afternoons, if I look down, I can see the Mitzvah Tank. When it rains, I ride the E Train. It’s about as far from a bucolic & serene setting as you can get. That’s why this is such a great time of the year. On my other two days, I can escape into my garden. I never did have much of a green thumb growing up. In college and for a few years after, the only kind of plant that I could consistently keep alive was a cactus and I think the cactus I had in Denver was just too nasty to die because nothing should have been able to live in that apartment. I’m surprised that I did. Though there are some questions as to whether I was actually living in the mid-80’s. I think I may have been in a slideways sort of existence myself but that is really here nor there and not anywhere near the point I am trying to make. That being said, it wasn’t until I got married that I started to think about growing a garden of my own. We started with flowers & herbs in pots on our townhouse deck. We moved onto to bigger pots of flowers & herbs when we bought our first house but the groundhogs figured out how to climb up on the deck so that ended that experiment. 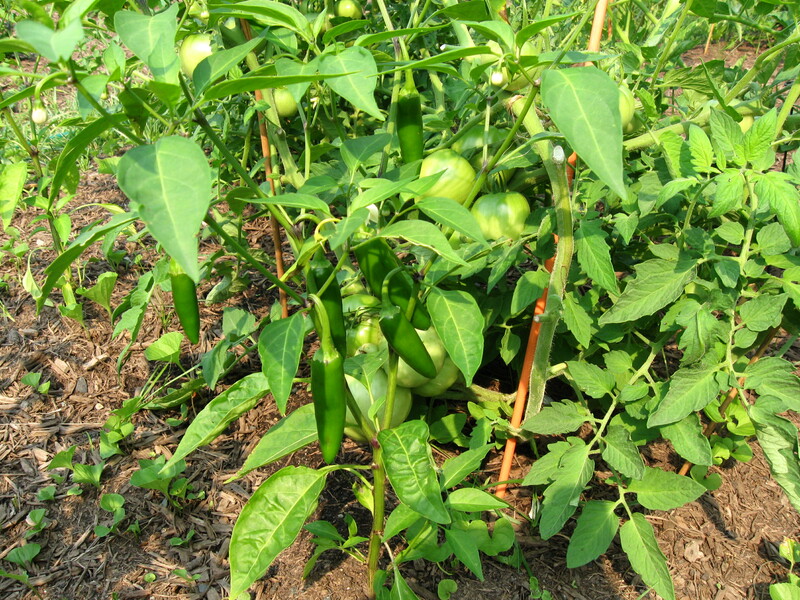 I hacked a garden out of the woods at our next house and despite the fact that we were deep in the woods and the sun rarely made it through, I still got a couple of tomatoes and a handful of peppers each year. Finally we moved to the house I will call “The Final Resting Place” because my next move is six feet under and that is as far as I am going. Here we had a huge backyard with a ton of sun and I knew it was time for me to embrace the notion of becoming a “Gentleman Farmer”. I didn’t just stick my toe in this time with a couple of pots & a small plot. I had a fence 7 feet high built out in my yard around a 50X30 patch of grass. I tore that grass up and worked that dirt. I added topsoil. I added mulch. I did it all by hand. I decided to go all natural too and just do battle with Mother Nature & her host of creepy crawlies in any and every which way I could as long as it didn’t involve chemicals. Most of all, I overplanted. I bought & planted every kind of tomato my local nursery carried no matter what it looked like. I did pretty much the same with the hot & sweet peppers and I planted more beans & squash than I could keep track of or even use. I figured I could grow them all and I would have basket upon basket of fresh produce all summer. To a certain extent, I did. You see what I forgot about was that my wife & kids were going to be away almost the whole summer because of the kitchen construction and with the house ripped up & no one home, it meant I was gone a lot too. The plants took their cue and ran away with it. I had plants stretching & growing everywhere. It was a vast web of shoots, leaves & branches. What was missing was any semblance of order or decorum. Plants went wherever they wanted to go and much like my life in Denver in the 80’s, I was their chief enabler. I didn’t know how to say no to a plant and I never cut any of them off or short. What I wound up with was a respectable haul that could have been oh so much more. I planned on being more judicious the following year as I hauled away the dead plants & vines on cleanup day. I wish I had remembered my end of season vows when the spring approached. I overbought all the same culprits and I was so excited that I planted them all 2 weeks earlier than I should have. Mother Nature took notice of my eagerness and proceeded to whack me with a heavy very unseasonable two day frost followed by torrential downpours. I tried to rescue what I could and backfilled with late starters. That turned into a mistake as a great number of the frost damaged plants started coming back slowly. Of course I had saved them and then compounded my errors by trying to shoehorn them in wherever I could. Which led to even more overcrowding especially when rogue plants from seeds gone by started sprouting up. Throw in surgery on my arm (no heavy work for what should have been two weeks but turned into four), enough rain to float Noah’s rowboat and my garden was once again an underperforming overgrown mess. I was depressed all winter. So this year I decided on the less is more approach toward the SwampGarden. I planned out my strategy with my wife, who this year has vowed to help, and we began our attack. We were going to take a cue from the wild grape tomato that had sprung up in the middle of the Cayenne & Cherry Peppers last year and completely took over that section of the garden. We were going to give the plants room to grow & flourish. As soon as the ground began to thaw I began to turn the dirt and my wife & children began to rake & pull weeds. We did it again a few weeks later and just like clockwork, the late season freeze came & went but this time there was nothing in the ground but worms. So this past Sunday we went to eat breakfast at the Big Red Barn and then it was off to the local garden store to pick up some plants. We also planted seeds for Italian Green Beans, Bush Snap Green Beans, Patty Pan Squash & Italian Style Zucchini. I also have seedlings working inside the house for Tabasco Peppers & Ancho Peppers but those got a late start and probably won’t come through. When all the raking, hoeing, weeding & planting was finally done on Sunday afternoon, we looked around the garden and we were all pleased. The plants all had room to go forth & multiply. They had room to spread & grow. They had room to be bountiful. And in the back of my mind, I was already plotting & planning on how & where to backfill in the places that I didn’t think there was enough. I am going to need all my strength and a good dose of NO to not give in to those urges. Get ready for the updates. Get ready for pictures. Get ready to live & die my many victories & defeats as I go toe to toe once again with Mother Nature and her many & varied elements meant to destroy my happiness. That is the view for from Behind The Shades…..swampy is gardening….